Looking for a relaxed dinner after a busy day of adventures? 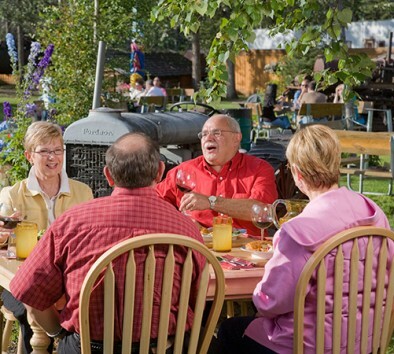 Head to the Alaska Salmon Bake at Pioneer Park where you’ll enjoy an all-you-can-eat buffet while surrounded by Alaskan history. Enjoy fire grilled salmon, hand dipped beer battered cod from the Bering Sea and beef slow-cooked to perfection. Salad bar, baked beans, rolls, dessert and non-alcoholic drinks are included with your meal! Sit inside our dining hall or outside where you can soak up the evening sun with a pint of locally brewed beer or a glass of wine (at your own expense). Get great tips from our grill masters who cook our wild Alaskan salmon perfectly over a bed of black spruce coals. After your meal, catch the musical comedy at the Palace Theatre, which is just a short walk from the Salmon Bake. If you only see one show in Alaska make sure it’s the “Golden Heart Revue.” Performed by a polished, professional cast, the “Golden Heart Revue” show is performed nightly at the Palace Theatre.